Kwain Photography Blog | Photos that I've made. Some may approach art and some just amuse me. Click on the photo to enlarge. It’s obvious that I like patterns, and these balustrades in Chicago caught my eye. I was out photographing around downtown Kankakee the other day and was getting some nice textures and patterns to use as part of other images. I liked this image on its own and processed and printed it and was pleased with the result. I’ve been playing with new software lately. It can’t do anything that older software did, but it does it faster and easier. 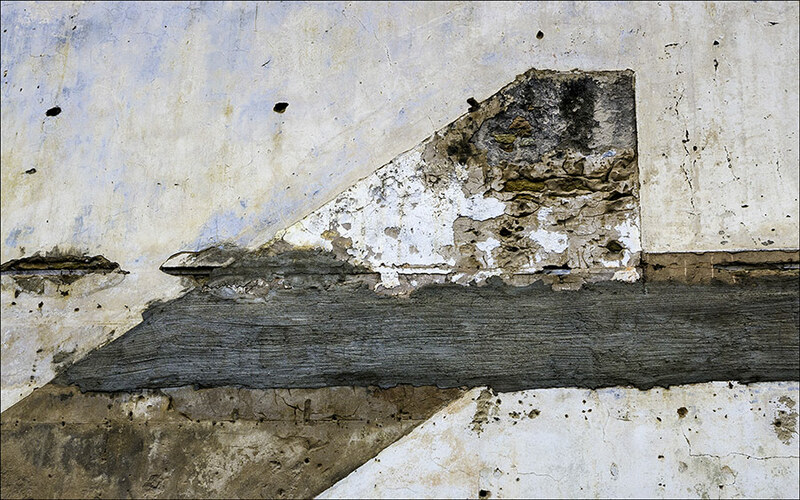 This is an image from my photowalk from October of 2013. I wasn’t happy with it originally, but felt that the monochrome treatment with contrast added. 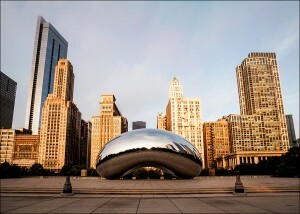 This is the ‘Cloudscape’ sculpture (titled ‘Cloud Gate’) in Millennium Park in downtown Chicago. Every time that I’ve gone to make an image of it, there was always a crowd of tourists and photographers with tripods at the ready. It’s fun to watch the tourists as they use the sculpture like a ‘fun house’ mirror. 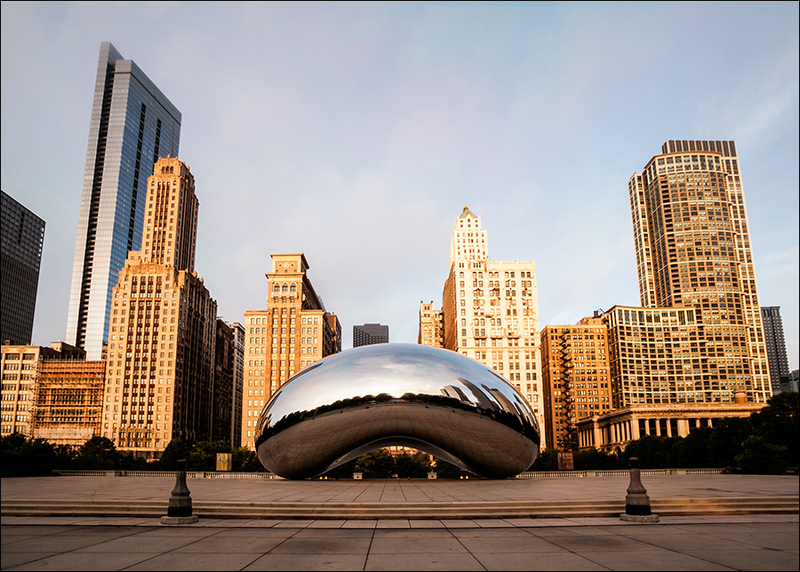 I’ve wanted to make an image of the Bean without any people around it so I figured that sunrise would have a minimum number of spectators and indeed, there were only a dozen or so there last Saturday morning. After some processing of a few exposures, I was able to come up with this image of the Bean all by itself seemingly waiting for the onslaught of the day’s visitors. 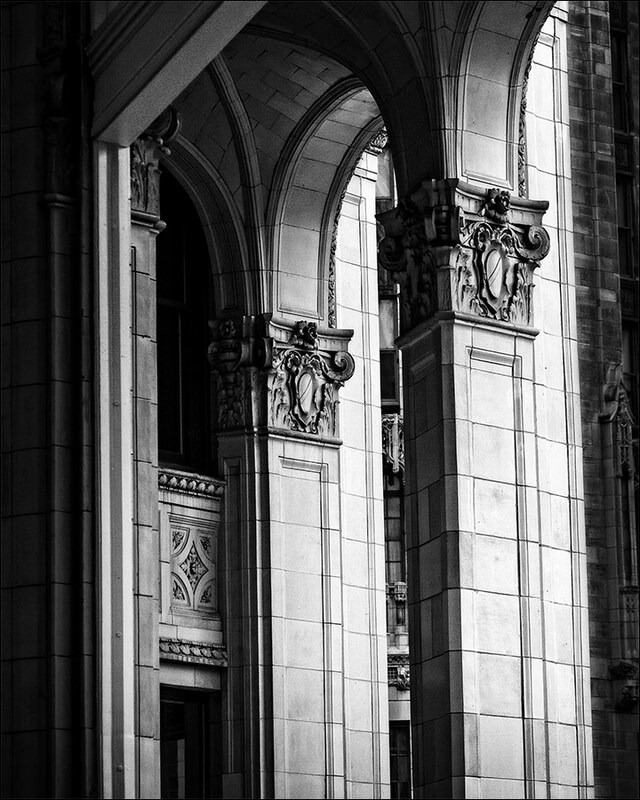 I was on a photowalk last Saturday with a group of people in downtown Chicago along the river. It was part of an international event with over 28,000 photographers in over 1200 photowalks. It’s a good excuse to go out and make images as well as meet all sorts of people. I worked with photographers from as far away as Crete, Illinois (about 10 miles from me) to a photographer on holiday from his home just outside of London, England. 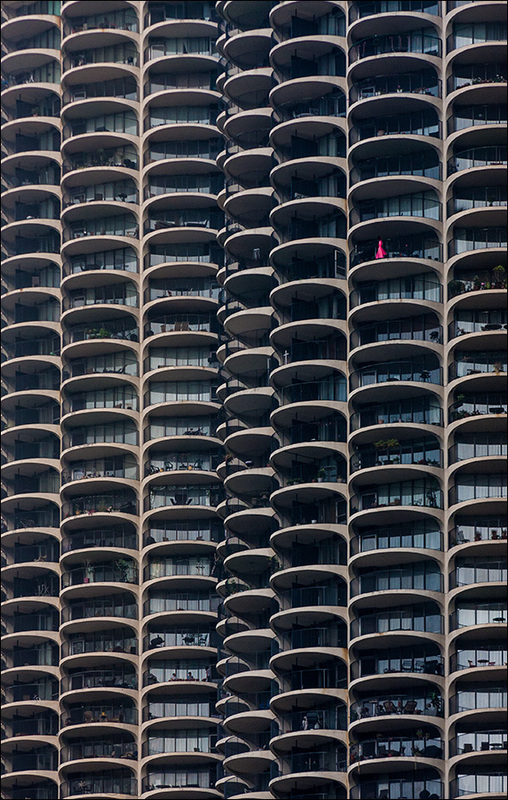 This image is of the Marina Towers, the upper portion of the Marina City complex. When they were first built, they seemed pretty tall, but now they’re dwarfed by all sorts of structures. 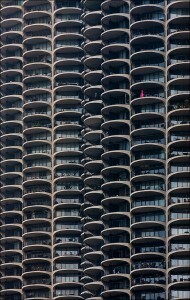 They are also famous for the chase scene in Steve McQueen’s final film (The Hunter – 1979) where a car makes an illegal exit from the 17th floor parking garage into the Chicago River. When I was looking at the tower, I noticed the red object (I think it’s a barbeque grill of some sort) and felt it stuck out nicely against all the dull concrete. One of those days when we had heavy rain a bit before sunset. 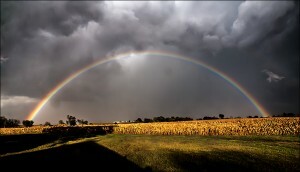 As the rain moved east, the sun came out and produced this rainbow. This was the second one I got to photograph this year. It would have been a bit more impressive if it had been a half hour later – the other one produced a complete double rainbow with a touch of a third one at the ends but the sun on the corn stalks was still impressive. Another image from the 2013 Will County Fair. 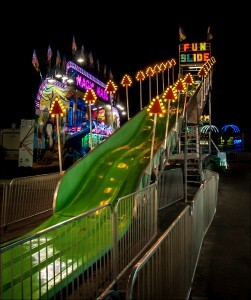 This was taken after the Fair had closed and the rides were about to be taken down. 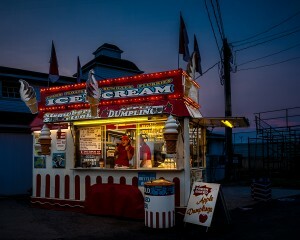 The total lack of a crowd adds a little loneliness and maybe mystery to the scene. 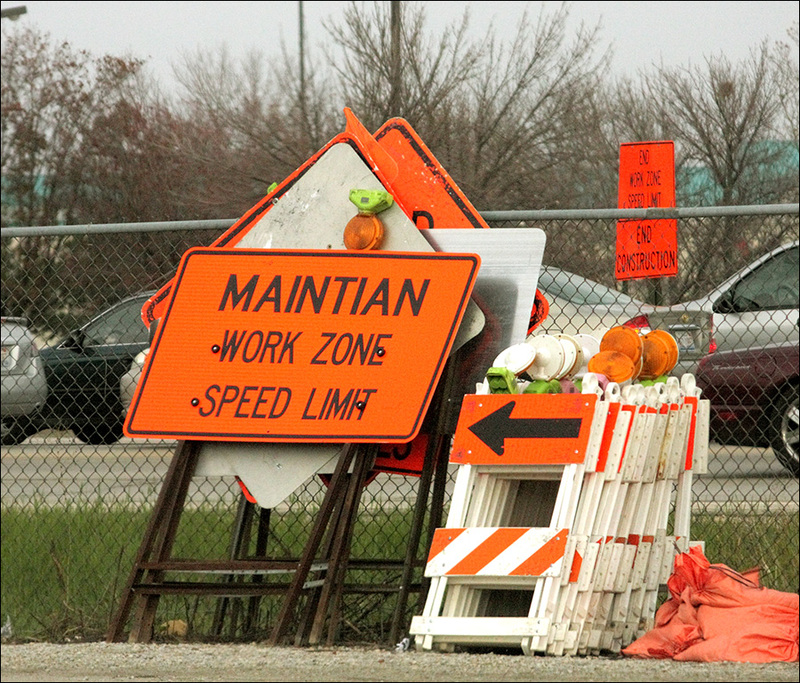 A sign that I saw a few months ago for the repairs being done on Route 50 near the I-57 intersection. 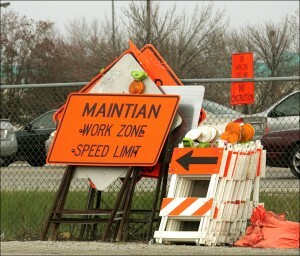 I guess that the sign shop doesn’t have spellcheck. Another 2013 Will County Fair photo. I’m trying to decide whether or not I’m going to remove the power lines (and possibly the pole too) from the upper right hand corner. I’m pretty sure that I’m going to lighten up the entire stand. The girl was standing under yellow lights and I might try to change the color temperature a bit to make her skin tones closer to reality without losing the overall effect of the yellow lights. It’s things like this that can make finishing and image take forever. 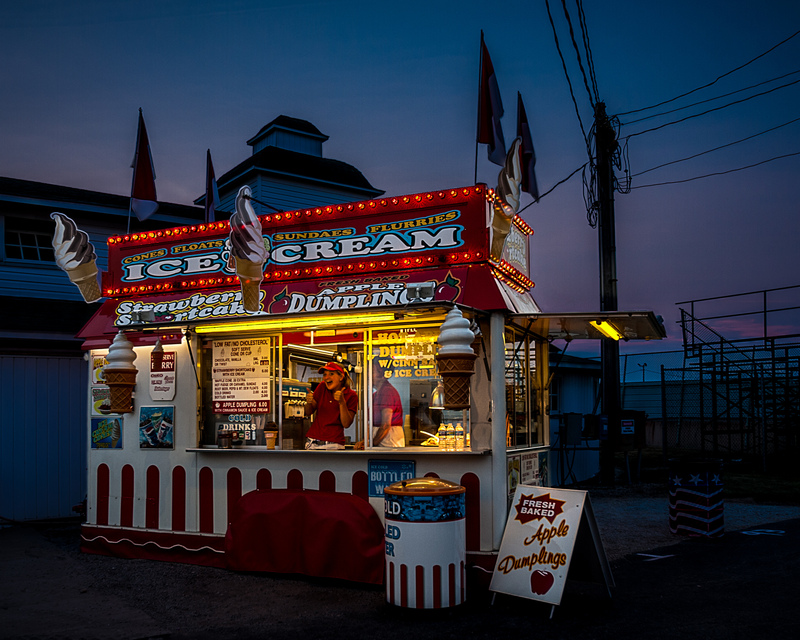 I’ve started processing some images from this year’s Will County Fair. 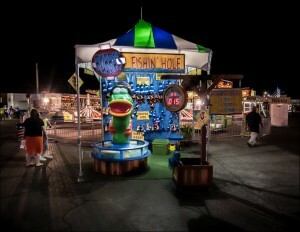 Here’s one of the games on the Midway. I didn’t feel like spending three bucks to see it in action. If anybody needs the info, I know where to buy most of the prizes wholesale.